Forgive me, It’s been seven days since my last confession. I’ve been sort of obsessed with sugar scrubs lately. Well, ok, completely obsessed. I’ve been meaning to try a lip scrub, but have not had time to sit and formulate, so I started looking for a recipe online, just to get a quick fix. Not surprisingly, I found a great one from The Soap Queen. The recipe was simple, although I would not recommend mixing in your sugar while the butter and oils are hot enough to be liquid; I melted sugar that way. Also, when I tried to pour it into my pots, the sugar fell to the bottom of the mixture. I should have known better, emulsified sugar body scrubs are made in a similar way, with the addition of a few more ingredients. glopped it back into my cute little pots. Much better! The sugar stayed suspended, and upon standing, it all firmed up nicely. Similar to canned cake frosting. Yum. Verdict: LOVE! My sweet & scrubby tendencies continue to grow deeper. This is definitely something I’d make again. 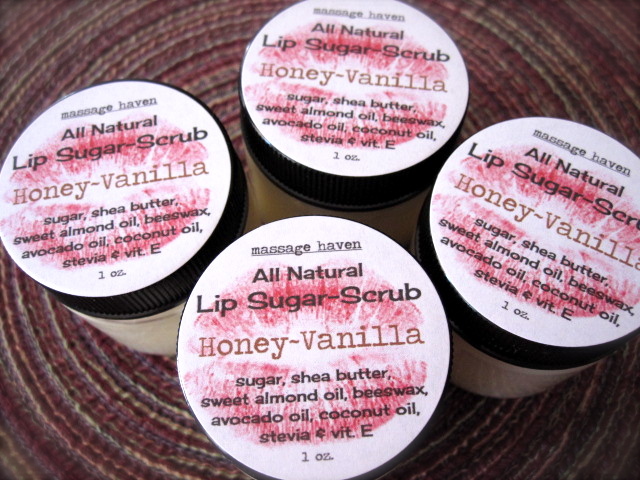 The scrub made my lips feel very soft and moisturized, without the application of additional lip balm. The oils & butter used for this are extremely emollient, plus non- (or very low) comedogenic. The only exception to this is the coconut oil, which, at only a minute amount, is used to suspend the natural stevia sweetener. and they taste really good! I liked the sweetness so much, I may add the Stevia to my next batch of lip balms. This may call for a larger variety of flavor oils. I’d better get on that..
Posted in My Hand-Made Soap and tagged avocado oil, coconut oil, lip balm, scrub, shea butter, Stevia, sugar, vanilla. Bookmark the permalink.